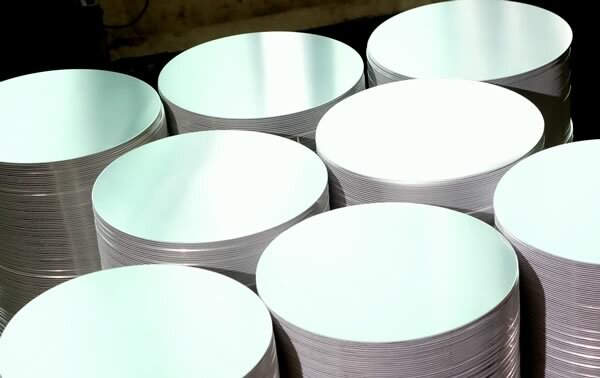 Aluminum Circles: Circle Aluminum Blanks: Meyer Aluminium Blanks, Inc.
As a global leader in the manufacturing and distribution of aluminum circles, we have the equipment, experience, and inventory to fulfill your requirements. With a diverse array of circles in stock, we have the sizes that you need–when you need them. Especially suited for deep drawing and spinning applications, our circles are the preferred choice of manufacturers in the metal spinning, lighting, cookware, ventilation, wheel rim, and pressure vessel markets–for over 25 years and running. Aluminum circles are just one of the products we provide. Contact us for more details. Circles can be provided with center holes upon request. Paper interleave and PE/PVC can be applied upon request. Some alloys can be provided as lighting-grade anodize quality and hard anodize (HA) quality upon request. All circles are shipped with material test reports. Don’t see what you are looking for? Give us a call at 920-467-9590 and we would be happy to partner with you to source your product. Contact our team by calling 920.467.9590 or fill out the quick form below. About Meyer Aluminium Blanks, Inc.
Meyer Aluminium Blanks, Inc. is one of the leading metal service centers in North America. We specialize in aluminum circles, sheets, coils and custom shapes. We can process and ship virtually any custom-size shape within three days. We were formed in 1994 as the North American distribution arm for our parent company, Meyer Aluminium Ltd. of Hong Kong.